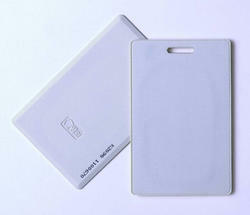 The PSC-1 is a member of Keri's Pyramid Series Proximity line of readers, cards, and tags for access control. At just 0.059 inches (1.5 mm) thick, the PSC-1 is up to 20% thinner than competing clamshell-type cards, making it more wallet friendly. In addition to the thin profile, users will appreciate the PSC-1’s robust design backed by a lifetime warranty. Within the Pyramid Series Proximity line, the PSC-1 may be used interchangeably with any other Keri credential or reader, including the P-300 Cascade Reader, the P-400 Gibraltar Reader, the P-500 Alps Reader, and the P-600 Rocky Reader and Keypad.